The alpine trail sections from Burro Pass down to the LaSal Mountain Loop Road open July 1 at the earliest, and close as soon as snow and ice come - usually in September or early October. Good weather will sometimes return and allow some mid-October descents. From an alpine pass above treeline, down to the sandstone canyon of the Colorado River. 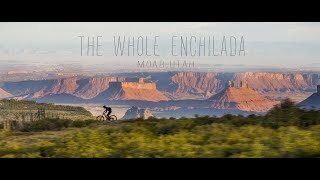 From black humus to red slickrock, singletrack to paved bike path: the Whole Enchilada covers every type of riding and scenery that Moab has to offer in one massive, magical, mind-blowing sensory overload. With the advent of shuttle companies, this has become perhaps the premiere Moab ride. On holiday weekends, you cannot find bigger crowds. 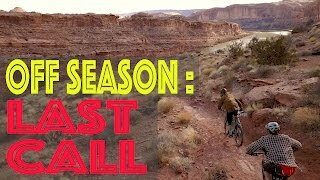 Pick an off-peak time for a better experience on this trail, and don't ride like you are the only one there. 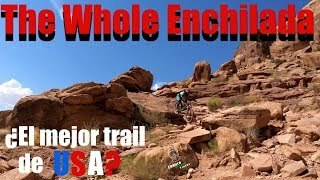 The Whole Enchilada is technically a complete loop, starting in town, involving many miles of paved road, and returning all the way back to town. This is a long, long way. Even with a shuttle, you are looking at over 35-miles back to midtown. Even though the shuttle version is mostly downhill, the Enchilada is not an easy ride. There are a couple of big climbs and if you've ever ridden in Moab before, you know that descending here is no walk in the park. Self Shuttle: Leave one vehicle at the Grandstaff Canyon Trailhead, and drive the other to the Geyser Pass Trailhead. Note that the drive to the pass can take upwards of an hour. Be sure you come prepared with enough food and water, and a good map or the MTB Project mobile app. You should familiarize yourself with the various bail-out options in case something breaks, or if the day gets too hot to continue. Assuming you have taken the commercial shuttle option, you'll begin riding from Geyser Pass in the LaSal Mountains. Hop onto the Geyser Pass - Burro Pass trail which starts just behind the pit toilet at the parking area. Once you hit the road again, turn left and the trail will change to singletrack (Burro Pass Trail #315). Climb hard as the oxygen rarefies. Reach the above-treeline pass at 11,150-ft and catch your breath for the spectacular down that is about to start. The section of trail dropping from Burro Pass is narrow, has tight switchbacks, steep grades, sharp rock and slippery roots through a damp evergreen forest. There are occasional stream crossings. It's a bit much for many riders, so don't feel bad if you have to walk a fair bit for a while. Eventually, the singletrack rejoins dirt road and you contour around through aspen glades, alternately climbing then dropping, until you reach scenic Warner Lake. From the lake, continue contouring around until you reach the start of Hazard County. Climb the stout hill at the beginning of this trail, then drop singletrack through the Gambel Oak hillside. This trail is not as hairball as it was when it was illegal, but there are still plenty of armored features, including gap jumps. You can hit them, or not, as your conscience dictates--the trail allows for both. Hazzard spits you out on the Lasal Mountain Loop road. Cross over and descend the Kokopelli Trail, a warp-speed dirt road that leads you onto the southwest wall of Castle Valley: the Porcupine Rim. The road begins to diverge from the developing rim as you cross a small cattle guard ride-over through a fence. The guard is your signal to watch out for a singletrack exiting right to hug the rim: this is UPS (Upper Porcupine Singletrack). Take the singletrack, or, if need be, bail out down the Kokopelli Trail to Sand Flats road. UPS climbs a bit, then begins to roll along the Porcupine Rim, eventually connecting to the somewhat more technical LPS (Lower Porcupine Singletrack). UPS and LPS are the favorite part of the Whole Enchilada for most riders, with ledges, swooping turns, tricky little drops and slickrock sections through Ponderosa and Pinyon/Juniper forest. Here, beside the abrupt scarp of the Porcupine Rim, the views are astounding. While mostly very rideable, there are some ridiculously difficult features in these two trail segments, like the (optional) Notch. While technically, you can ride both directions and session the tricky bits, in reality, this is a busy, de facto downhill trail, so be forewarned! Come at an off-time if you want to dawdle. Come early (be first) if you want to dive-bomb it. The singletrack ends at the view point where the traditional Porcupine Rim trail climbs up to join the rim. Continue out the Porcupine Rim jeep road, which is ledgy, fast and fun. It hugs the rim for a while, then deviates to the left to find a way down off the mesa. Passing through various rock levels yields fun drops and slickrock sections. Eventually, the road narrows to singletrack again as the trail enters Jackass Canyon to descend through major cliffs to the Colorado River. This is (or was) the most technical part of the ride, though recent modifications have destroyed much of the challenge in this classic test-piece. Please write to Grand County to request that they stop modifying existing trails that have been world-class attractions for 30-years. Reaching the river, join the jaw-dropping new bike path leading back to town. Due to the narrowness of the road corridor between the cliffs and the river, this path is built for part of its length on expensive elevated pilings! Where it runs on the actual roadbed, there is a separating curb. The path joins with the Moab Canyon bike path out to Arches and I-Sky at the highway. Praise the Lord! Mention how great this is in your letter to Grand County! The Whole Enchilada was originally conceived and ridden as a monstrous loop. From town, back to town: a ride in the same vein as the utterly psychotic Moab Centurion. While few riders actually do the Enchilada without a shuttle--adding 30-miles of up to an already big day--it's nice to recognize the burly visionaries who gave us such an amazing experience. Help preserve this experience by not altering the trail! In the past year, many sections of this magnificent ride have been seriously diminished by well-meaning riders who lever boulders out of the way, cut tree branches, build unnecessary ramps and otherwise dumb things down to an easy level. Give your future-self a brilliant gift and keep it challenging: if you can't ride it yet, then walk it until you can! Rode The Whole Enchilada from the Jimmy Keen trail into UPS. Jimmy was horrible - all covered in snow and mud. From UPS and down all was awesome! Epic. Lung buster climb to Burro pass. Crazy decent from there. 7hrs 54mins with lots of picture time. From flow to sketchy rides along cliff faces. LONG, but do-able. Bring lunch. A GREAT trail with vistas and challenging terrain. You get TIRED at the end. Leave room for the paved ride home. did with Michael S. Burro pass closed till July 1st.Taked on Jimmy Keen trail. Started at Kokopeli due to snow. Great rides today! Above hazard was not accessible but the rest was perfect. Best ride of my life. Also the most technically challenging, but the oxygen-depriving physical beating was overshadowed by the breathtaking views. The views on the rim can be distracting! Dropping in on a step-down. A bit of exposure with great views. Scary cliff!!! Are you scared of height? Huge slickrock expanse about half way through UPS. 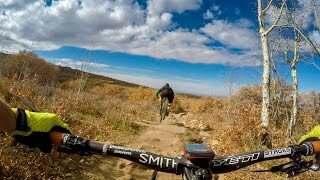 Rock singletrack, only in Moab! Getting air on upper Porcupine Rim. end of Porcupine Rim in the early morning. A sandy, slippery slickrock section. Even the unicyles like the technical sections. Let the final section of fun begin. No more dodging cars on the highway. Starting to hit the cliffs.